World Cup Series Champion, Elizabeth Price has chosen to attend Stanford university rather than contend for a world title in the fall. Photo by Christy Linder. Elizabeth Price’s decision to retire from the national team in order to go to Stanford. The unprecedented 7th national title with a low for Kohei Uchimura. Chinese women’s National Championships; mature choreography; Yao Jinnan’s 7.0 bar routine; beam star, Bai “The Blue Finch” Yawen; Huang Huidan’s bar dismount! Thi Ha Thanh Phan showing she’s not just a vault worker at the Osijek World Cup, and Brazil debuts floor cosmonaut-tumbler, Angelo Dias de Assumpção. Is it fair that both an Arabian double pike is an E and an Arabian double pike ½ out is an E, or should the half turn have a greater value? FIG stepping in to fund Ukraine’s trip to the European Championships. Louis Smith MBE is not happy about being off the Euro team and lets everyone know about it. Can British Gymnastics improve their intra-team communication? Our favorite champions from the level 10, JO National Championships, including Alicia Boren’s hot FX and Olivia Karas stuck-like-a-mutha vault. Louis Smith, Luke Carson and Theo Seager comment on the European Team selection. As Spanny reported months ago on this very show, Shawn Johnson WILL be on The Celebrity Apprentice next season. New Super Awesome Choreographer alert! 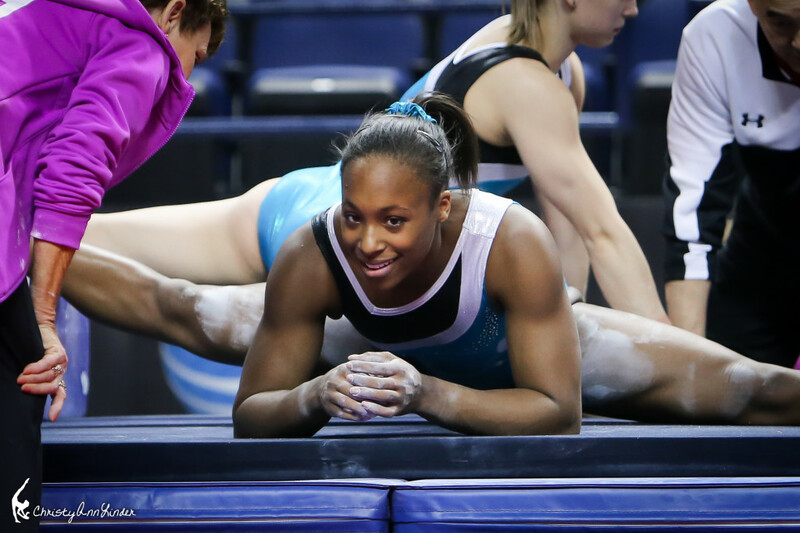 Gina Starbuck, watch this and tell us which gymnast is best suited for her style. The similarities between coach Aimee Boorman and Simone Biles and the way Aliya Mustafina and her coach, Raisa Ganina work together. The latest McKayla Maroney interview gives us more details on her extremely serious leg injury on tour. How will gay and female fans be treated at the Doha World Championships in 2018? Spanny Tampson recaps The Sarah and Suzanne show and NADIA the movie! Uncle Tim and Jessica weigh-in over at The Couch Gymnast for Love it or Hate it? The Non-Ballet Routine. Gymnast Yan Mingyong releases early wedding photos of himself and his wife Ma Qiujing via his Weibo account on Thursday, May 8, 2014. Here is the video playlist for this week’s episode. Jake Dalton double twisting double layout. Jake Dalton arabian double layout (Tamayo), half out. Didn’t even catch it in the edit! Yes, Difficulty score, not a lowly 7.0 execution score. Oh dear. Thank you. I disagree on the amount of sound effects used… NOT ENOUGH!!! Your Rupaul avie just won me over. I agree with you about everything from now on! You can never have enough RuPaul. Perhaps we need a RuPaul sound effect…. Welcome back! Please help me with my gymnastics dilemma: I want to see this Chinese floor exercise set to Mario music! Please! If this is Episode 93, what happened to Episodes 91 and 92? 91 and 92 were re-runs. 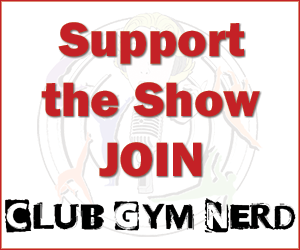 They will show up in your iTunes, email, RSS or Stitcher subscription. It’s interesting that one of the commenters talks about being a feminist and thus thinks that the Doha competition will be good for this middle eastern country. As a feminist – maybe even radical feminist – who has also spent time in the Middle East one thing I have a hard time with is getting Western Feminists to understand that a Western eye is not always the most appropriate eye to view that world through. I can tell you that, as a woman, I feel much safer in places like ‘Amman, Aqaba, Taba, or Palestinian sections of Jerusalem than I do in most cities in the United States, or other western cities. While western feminists may view how women are treated as oppressive, there is something beautifully freeing in being able to walk across a large city like ‘Amman, Jordan or Palestinian Jerusalem without worrying about whether I’ll be attacked or not because I am a woman. There’s also something really beautiful and freeing in the space that is created when Muslim Arab women get together, and men respect that they can’t just walk into that space without announcing their presence. There’s also something wonderfully freeing about wearing a hijab, because, when I do, I don’t have to worry about my hair and what it looks like. The added bonus is that I get to coordinate the color of my hijab with my clothes! So, please, before you judge or make statements about how oppressive Qatar is as you view it through your feminist eyes, remember that they are western feminist eyes. Considering how disgusting and shameful gymcastic’s coverage of Russian Nationals was, I’m not sure that their coverage of Euros will be any better. Their coverage of anyone non-American at Worlds last year was just in line with how they had covered Russian Nationals. I don’t have much expectation at the moment. I would.be very glad to be proven wrong, though, so I hope that they in fact do prove me wrong. Thanks for returning! Also, Jess, I’m very impressed with your Chinese name pronunciation. Regarding Chinese nationals, Yao Jinnan(/Ziyi) actually won with 59.4. That was with a domestic bonus system, but I think the bonus was only a few tenths. And they are actually considering giving Shang Chunsong the Mario music, according to an interview with Coach Wang posted on on this tumblr: http://16-233.tumblr.com/page/11 I DON’T UNDERSTAND! Finally pronounced something correctly! Woohoo! Good point about the domestic bonus system. Forgot about that. Will mention it. Whaaaat! Shang and the Mario music….omg.